Climate change could substantially impact the energy system in the Southwest through less efficient power generation, reduced electricity distribution, and threats to energy infrastructure—all while peak energy demands increase. In this blog, the fourth in a series about the recently released Assessment of Climate Change in the Southwest U.S., I expand upon these and other key findings from Chapter 12, which describes the vulnerability of our energy system to climate change. Then coordinating lead author Vince Tidwell, from Sandia National Laboratories, contributes his opinion. Before we get to how climate change may affect energy in the Southwest, let’s first discuss the current energy infrastructure. As of 2009 (all of the following numbers are from 2009; EIA 2010), the Southwest produced about 12.7% of the nations’ total energy, an increase of 180% from 1960. Of that, 43% was natural gas, 21% crude oil, 19% coal, 10% renewable energy, and 7% nuclear. California, Colorado, and New Mexico were among the nation’s top ten energy-producing states, with California specializing in crude oil and renewable energy production, and Colorado and New Mexico specializing in natural gas production. Similarly, the Southwest consumed 12.1% of the nation’s total energy (including transportation, industrial, residential, and commercial sectors)—up 255% from 1960. Overall in the region, demand was met by petroleum products (42%), natural gas (32%), coal (13%), renewables (8%), and nuclear power (5%). California dominated consumption, followed distantly by Arizona and Colorado. However, on a per-person basis, California and Arizona had the lowest consumption with 220 million British Thermal Units (BTUs) per person and New Mexico had the highest with 330 BTUs per person. Energy demand: As temperatures increase, especially summer daytime highs, peak period electricity demands for home and commercial summer cooling will increase. Natural Gas: Warmer temperatures could decrease the capacity and efficiency of natural gas turbines. Other types of electric power plants also may be affected by warming, including coal, nuclear, wind, solar, bio-power, and geothermal. Adaptation measures that could be implemented include installing new types of cooling equipment and expanding existing capacity. Hydropower: Hydropower generation could be impacted by several factors, such as changes in runoff due to decreased precipitation and increased evaporation, earlier snowmelt, and shifts in the frequency of extreme events. To mitigate these impacts, the authors suggest efficiency upgrades at existing hydroelectric facilities, development of new low-impact facilities, and altered reservoir operations. Thermoelectric: Thermoelectric generation could become limited by reduced water supplies stemming from drought, which could cause the surface of a reservoir to drop below intake structures, limit the access to water, or raise water discharge temperatures above environmental limits. Mitigation and adaption options include integrated strategic water-energy planning, utilization of non-potable water sources for cooling, and using dry-cooled systems. Transmission line capacity: Higher temperatures will increase demand for electricity while decreasing the carrying capacity of transmission lines. Two options for coping with and avoiding decreased capacity are to 1) reduce line capacity requirements by producing a larger fraction of power at or near the destination, and 2) place transmission lines underground. Substation/Transformer capacity: Higher ambient temperatures and high minimum temperatures can affect transformer performance and reduce the peak-load capacity of banks of transformers in substations. Based on the projected number of days with maximum temperatures greater than 95°F, the southern and eastern parts of the Southwest are more at risk of reduced substation peak capacity. One adaptive strategy utility planners can take to offset future losses and increase substation capacities is to proactively install new types of cooling. Wildfire risk to electricity transmission: Not only can wildfires—which are predicted to increase in size and frequency due to climate change—physically destroy transmission lines, but they can also affect the capacity of a line through heat, smoke, and particulate matter. The effects of firefighting, such as aircraft dumping loads of fire retardants or preventive shutdowns, can also affect transmission operations. These impacts could be reduced by such means as increasing fire corridors around transmission lines, using transmission line materials that can withstand high heat, and building excess transmission capacity. Sea-level rise and coastal inundation risk to power plants and substations: In California, coastal energy infrastructure will be at higher risk due to rising sea level, increasing high tide levels, more frequent extreme surge events at high tides, and accelerated shoreline erosion. Adaptive measures include building higher levees to protect existing power plants and constructing new plants at higher elevations, farther from the ocean. Cost of climate change: Any increase in energy prices due to climate change, such as increased demand and higher temperatures putting stress on the system, will have a direct impact on consumers. Climate policies limiting greenhouse gas emissions, while beneficial for limiting climate change and reducing air pollution, have the potential to increase energy costs to consumers. Figure 1: Schematic of how climate change may impact energy infrastructure in the Southwest. Figure 12.5 from Assessment of Climate Change in the Southwest United States. Tidwell: Drought I believe is of most concern. Most people will realize impacts through the discomfort of heat, and irrigation restrictions on their lawns and gardens. Others will be impacted through loss of recreational opportunities such as closed forests, low water for boating/rafting. Farmers will feel the pinch through reduced yields or lost crops/livestock. There are also impacts to the ecosystem through wildfires and beetle kill, which affects everyone. Tidwell: In terms of opportunity, a strong drought will raise attention and encourage the public/decision-makers to work together to take action. The barrier is the multiplicity of interrelated issues and the great variety of values placed on water and the environment. Tidwell: Development of “shortage sharing” agreements in times of drought. That is, expedited plans for dealing with limited streamflow and reservoir levels. Most of New Mexico’s water is adjudicated and will take many years to complete the adjudication process. We need plans for the interim. Tidwell: Drought/heat waves have the potential to impact the electric power system in numerous ways. Although in each case the impacts are relatively small, together they add up. 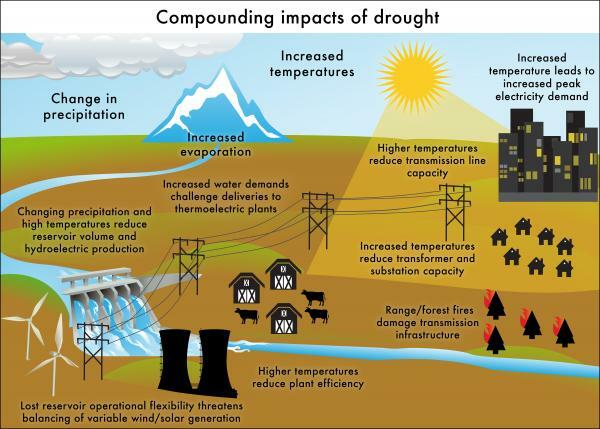 Specific impacts include: increased demand, reduced efficiency in electricity generation, reduced power line capacity, reduced transformer capacity, reduced hydropower production, threatened thermoelectric power production due to limited water availability, and impacts of wildfire on transmission capacity. Tidwell: I was part of the author team for the Water-Energy-Land chapter for the 2013 [National Climate Assessment]. I would like to see a similar chapter developed and explored for the Southwest regional analysis. These cross-sector interactions are of particular interest to me. In our next two blogs, we’ll wrap up the series discussing adaptation and mitigation options, as well as what’s already being done in Southwest states to adapt to the impacts of climate change. Coordinating lead authors Diana Liverman, from the University of Arizona, and Susanne Moser, from Susanne Moser Research and Consulting, will give their opinions on the above questions.